Mornings are for waking up early (but not too early) while still feeling like I've slept in late (but not too late). Rolling over to Jay's side of the bed after he's gotten up for a shower and stealing all his pillows. Getting a kiss good-bye and an earful of silly words before he leaves for work. Holding my belly as I slowly wake up and feeling my daughter wiggle around, wishing me a good morning and assuring me she will not be making an appearance anytime soon. Feeling warm and cozy and grateful. Mornings are for turning the corner from the bedroom to the living room and loving the way the light shines through the blinds so perfectly. Being way too excited about choosing from the five different types of breakfast cereal in the kitchen. Cleaning up the duplex a bit for the day ahead and reminding myself to take out the recycling for the fifth day in a row. Wishing I was the sort of person who drank regular coffee, just so I could enjoy the aroma swirling out of the mug. Mornings are for sitting down at the computer to catch up on tweets, a handful of long-overdue emails and a few unread blogs. Taking a deep breath and writing out my to-do list for the day and double-checking my (now incredibly full) planner. Smiling when I realize I've sold something from my shop. Dreaming up new items to create next. Wondering how I'll have the time to do it all within the next few weeks. Mornings are for calm thoughts. Bed-head. Hot chocolate. Wonderings. Important decisions, like whether or not third-day hair is acceptable for brunch and if I can continue wearing the same long skirt for the next month straight—in order to hide my ankles, of course. Mornings are for hopes and dreams. Positivity. Taking the time to say a quick prayer about a situation that has my heart completely torn up in bits, letting go of the worry and acknowledging that not every situation is meant to be fixed—especially by me. Giving myself more credit while also reminding myself of my limitations. Deciding that limitations don't mean much, anyway, and to continue dreaming big. Mornings are for feeling incredibly thankful. I love your mornings. I want my mornings to take a hint from yours. Actually, let's just trade mornings and call it good. I love this:) Amazingly beautiful! Love this. And can't wait for your post on mornings once the baby comes. It'll go something like "mornings are for feeding frantic baby whilst shoving granola bar in my face, kissing tiny cheeks, and laughing about how I used to live a drool free life." This is written so unbelievable beautiful. Have a wonderful day after a wonderful morning! Mornings are for reading Kerri's blog and wishing I were there, too! I absolutely contemplated third-day hair for work this morning. A few months ago, the thought would've been inconceivable, but I'm coming to terms with letting my hair do its thing the second day. Somehow, it always looks better than the first day. So the third can only be even BETTER, right? RIGHT? Beautiful post, Kerri. Just beautiful! That is my idea of a perfect morning. i love this. there's something romantic, almost magical about mornings. like a reminder that we're always given new beginnings. also, 3rd day hair is always ok in my book. and rock that long skirt, girl! Mornings are glorious! I always like to add some dancing to my mornings. It's perfect! Morning are for sitting 1/2 hour to have breaksfast... alone... in peace! This is such a lovely post! I too get to steal a kiss from my fiance in the morning, along with his pillow after he has gone to work. 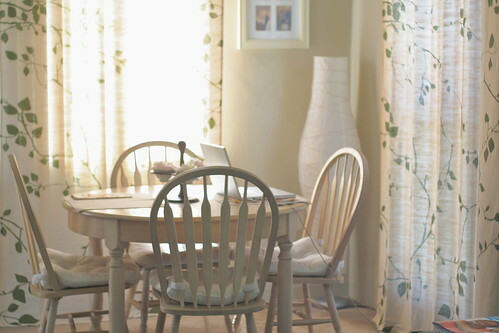 I then mosey on down to make some coffee and sit in my office/craft space where I catch up with the rest of the world. It makes me very thankful and a much more cheerful person!